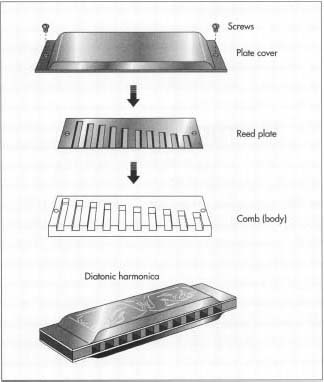 The harmonica, or mouth organ, is a hand-held rectangular musical instrument. As the musician inhales and exhales into evenly spaced air channels, the metal reeds within produce musical tones. The length and thickness of the reed determines the note that is heard. Descended from the Jew's harp and Chinese sheng of ancient times, the harmonica has engendered various nicknames, including blues harp, pocket piano and Mississippi saxophone. Since its beginnings in the early 1800s, the harmonica has been used in variety of musical forms, from classical to folk to country to rock to blues to jazz. Although it is impossible to pinpoint the exact day that the hannonica was invented, the first patent was issued to the teenaged Christian Friedrich Buschmann of Thuringer (now Germany) for his aura, a 4 in (10 cm) mouth organ that featured 21 blow notes arranged chromatically. It was quickly imitated throughout Europe and went by many names, such as mundharmonika, mundaeoline, psallmelodikon and symphonium. In 1826, Joseph Richter, a Bohemian instrument maker created a variation that was to become the standard. Richter's version featured 10 holes with 20 reeds on two separate plates that allowed both blow notes and draw notes. The plates were mounted on either side of a cedar comb. He tuned it to a diatonic, or seven-note, scale. Several decades later, a young German clockmaker named Matthias Hohner learned to make a harmonica and consequently changed professions. Starting his new company in his kitchen in 1857, Hohner turned out 650 harmonicas in his first year with the help of family members and one paid worker. In 1862, Hohner, an astute marketer who had his name engraved on the plates of his harmonicas, introduced the instrument to North America, where its portability and affordability made it a favorite of the Western cowboy. African-American blues musicians also found the harmonica an affordable alternative to a piano or horn. Sonny Terry, James Cotton, Charles Musselwhite, and William Clarke are just a few of the blues legends who have lent their talents to the harmonica. The harmonica soon entered the main-stream. In the period just before World War II, boys' harmonica bands were a popular vaudeville act. Larry Adler made a name for himself playing the harmonica with major symphony orchestras. In the late 1940s, the three-man Harmonicats sold 20 million copies of their rendition of "Peg o' My Heart." At the beginning of the 1960s, a group of 105 amateur harmonica players in Levittown, Pennsylvania, dubbed themselves the "Largest Uniformed Harmonica Band in the United States." Borrowing heavily from the African-American blues legacy, numerous white rock-and-roll musicians picked up the harmonica. Folk singer Bob Dylan popularized the practice of placing the harmonica on a neck frame to free the hands for playing the guitar, piano, or other instrument at the same time. accompaniment. The single-reed diatonic harmonic is the most popular and can be heard in rock, country, blues, and folk music. It features 10 holes with 20 reeds, 10 for blow notes and 10 for draw notes. The tremolo has double holes, each of which contains a reed cut to the same key. Each hole allows both blow and draw notes. In the octave-tuned diatonic, the reeds in the double holes are an octave apart. Chromatic harmonicas play a 12-note octave, including all sharps and flats. The orchestral model can feature all blow notes or a combination of blow and draw notes. Some are designed to play chords. Originally, the body, or comb, of all harmonicas was constructed of wood. Now, most are made from injection-molded plastic. Some high-end models are made from metal alloys, lucite, or silver. Each of these materials produces a distinct type of sound. Marine band and blues harp types continue to be made from moisture-resistant soft wood. The semi-hardness of the wood produces a rich sound while resisting swelling. Reeds are cut from precision-tapered strips of brass alloy (a mixture of copper and zinc) material. Reed and cover plates are also machined from brass. Screws and rivets are used to fasten the comb, reeds, reed plate, and cover plate. While the individual parts are produced by machinery, the assembly is done by hand. 1 Wooden combs are cut from a block of wood. Channels are carved out in descending lengths across the comb. Plastic combs are injection molded. The plastic compound is heated to a semi-fluid state and then mechanically injected into a mold. The compound hardens quickly, the mold is popped open, and the new comb is expelled. 2 The reed plate is stamped and machined, creating slits that correspond to the channels on the comb. Reeds are cut and tapered by machine. One end of each reed is riveted to the reed plate so that a reed lays over each slit. The opposite end of the reed is left free. 3 The reed plate is manually tuned. The tuner strikes the appropriate tuning fork and then files each reed to the correct tone. Filing the base end lowers the pitch; filing the free end raises the pitch. 4 The reed plate is attached to the comb with nails or screws. The assembly is done manually at a workbench similar to that used by a shoemaker. The nails are inserted into the holes with needle-nosed pliers and then tapped in gently with a small hammer. 5 The plate cover, which has been machined, shaped, and stamped with the company name and harmonica type, is attached to the reed/comb assembly with screws or nails. 6 The harmonicas are inserted into boxes and packed for shipment to retailers. In the twenty-first century, less of the assembly will be done manually as the process becomes more automated and calibrated by computers. 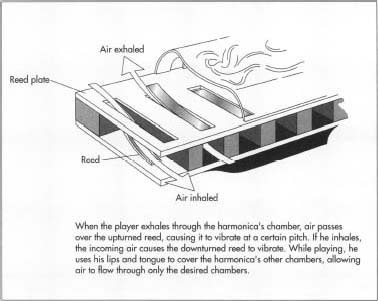 Manufacturers claim that the computerized process will increase the life span of the reeds and produce a harmonica that is more airtight. Chelminski, Rudolph. "Harmonicas are… Hooty, Wheezy, Twangy and Tooty." Smithsonian, November 1995. Hohner Homepage. http://www.hohnerusa.com/htnil/history.html (January 29, 1997). IT IS NOT TRUE THAT THE QUALITY OF THE SOUND DEPENDS ON THE COMB MATERIAL. IT DEPENDS ON THE EMBOUCHURE, AIR PRESSION, USE OF THE TONGUE, ETC.